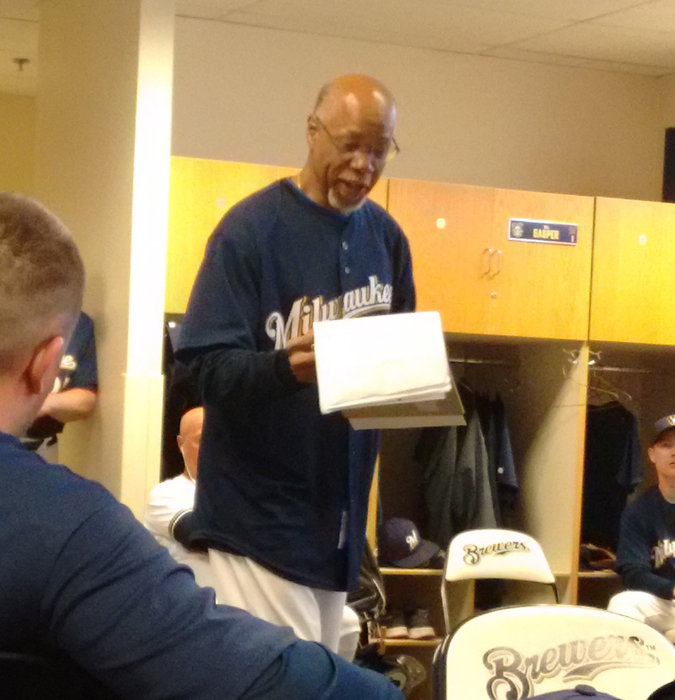 The latest Brewers Fantasy Camp featured art I created which focused on the legendary 1987 Milwaukee Brewers, who began their season with a 13-game winning streak. 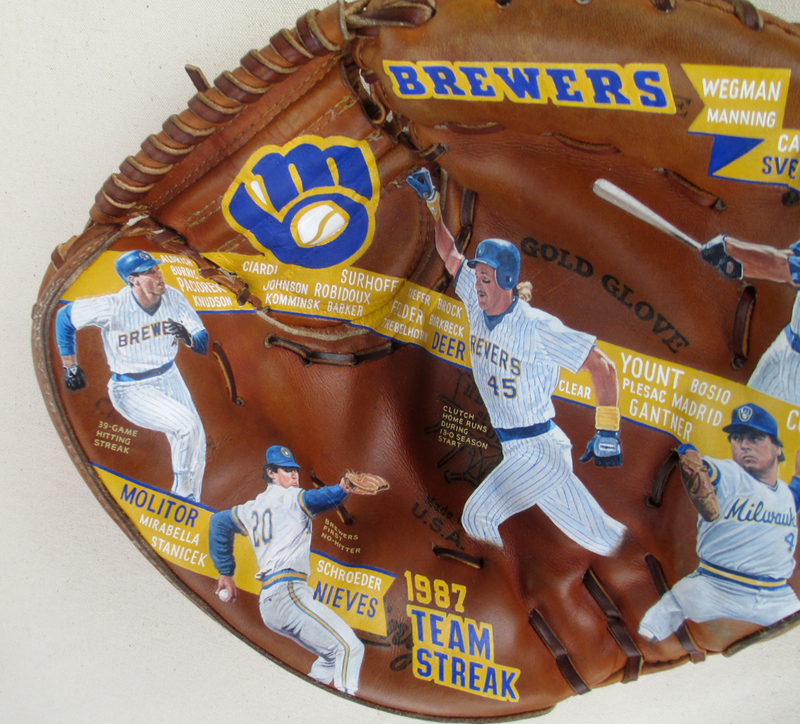 "Team Streak", as they became known, is probably one of my most ambitious glove art paintings so far. Paul Molitor had a 39-game hit streak that season and is depicted coming out of the batters box after his hit in the last game of his streak. 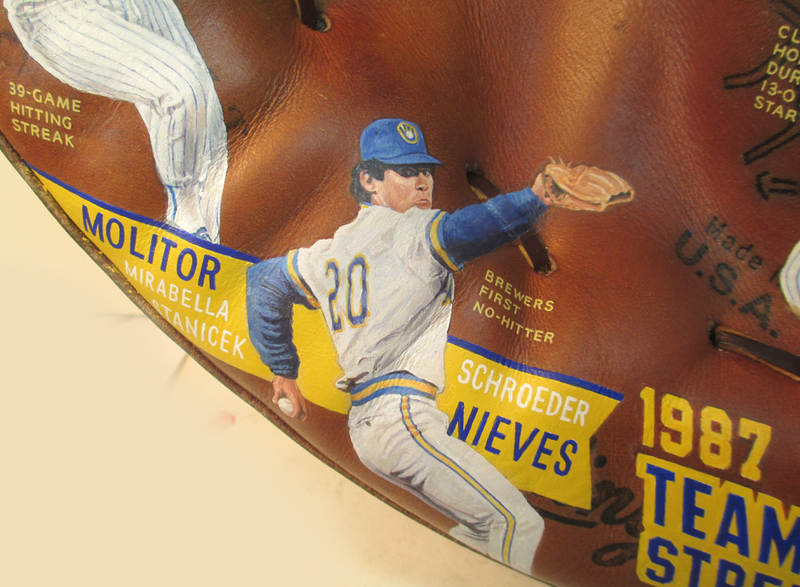 Juan Nieves is depicted throwing the Brewers first no-hitter, a game caught by Bill Schroeder. Teddy Higuera threw 32 consecutive scoreless innings in 1987. Dale Sveum had the game winning home run on Easter Sunday, keeping the Brewers winning streak alive. And Rob Deer led the way on the Sports Illustrated cover story about the hot Milwaukee team. The image of him on the cover of SI was the basis for my portrait of him. Being a painting about a team, it seemed natural that the whole team should be represented. 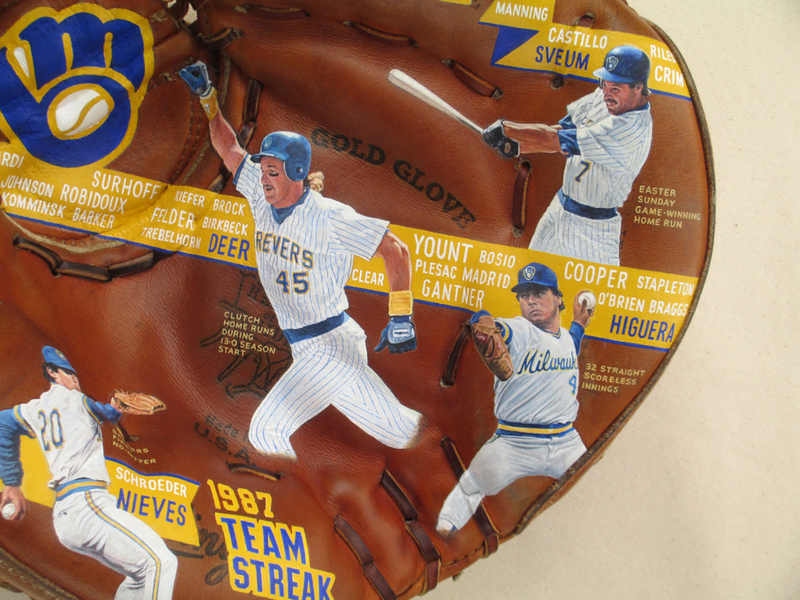 All player names from the '87 Brewers roster plus manager Tom Trebelhorn are included in the design. 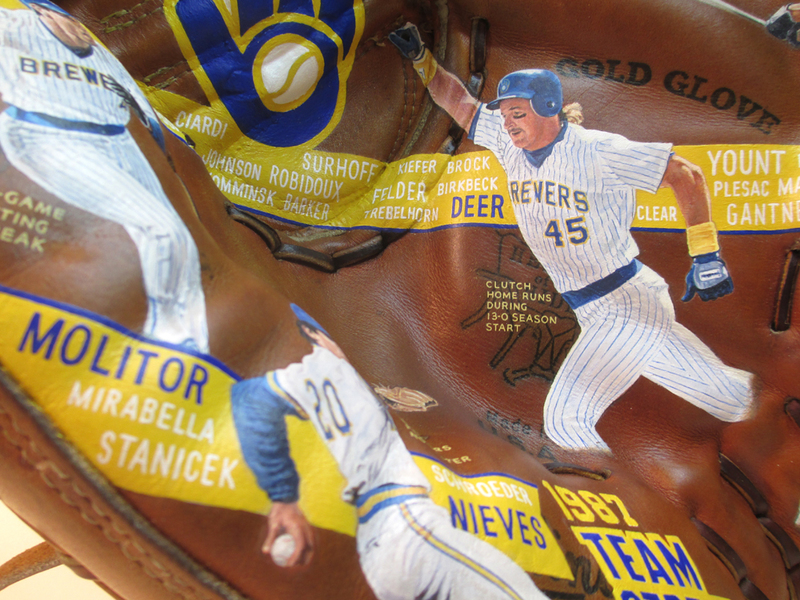 This glove art was part of the fundraising efforts of Brewers Fantasy Camp. The raffle for the "Team Streak" art raised money for Stars and Stripes Honor Flight of Wisconsin. The winner of the framed painted glove was Fantasy Camper Scott F., who says he already knows exactly where it's going to hang in his home. 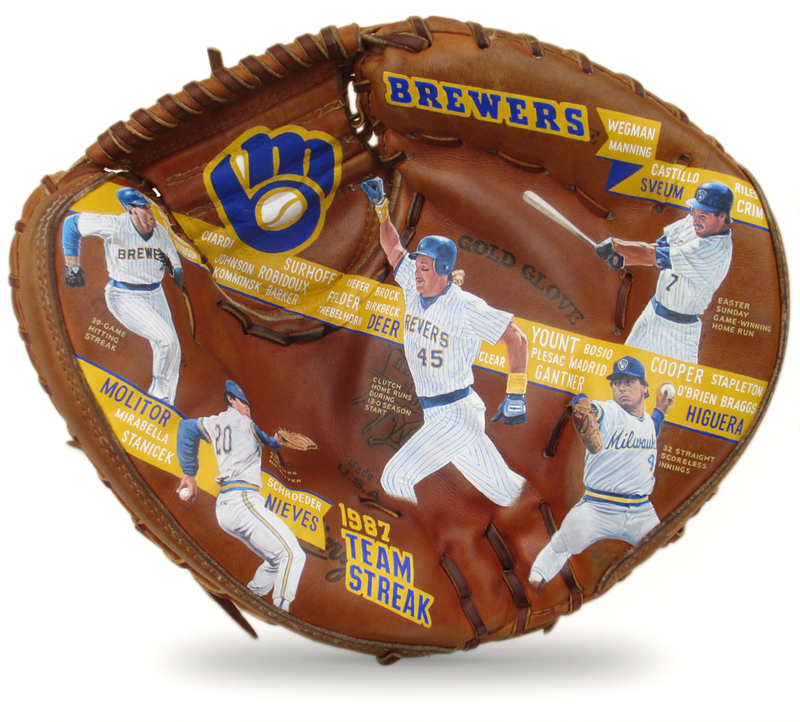 Framed "Team Streak" Baseball Glove Art with artist Sean Kane and winner of the painting. While not raised as a native Brewers fan, it's hard not to root for such a great group of guys and the opportunity to share my work with them in the desert the past few winters. 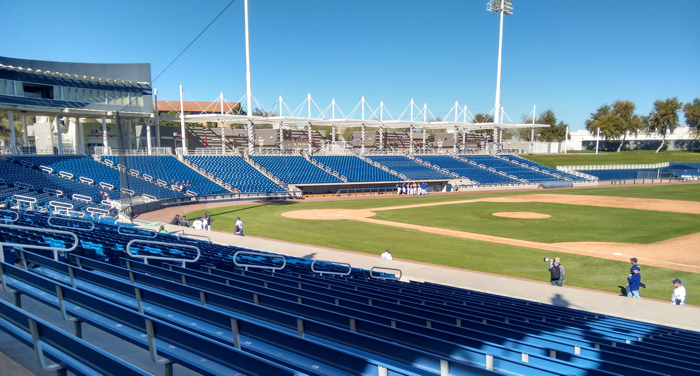 Maryvale Stadium, Phoenix, getting ready for Brewers Fantasy Camp game. 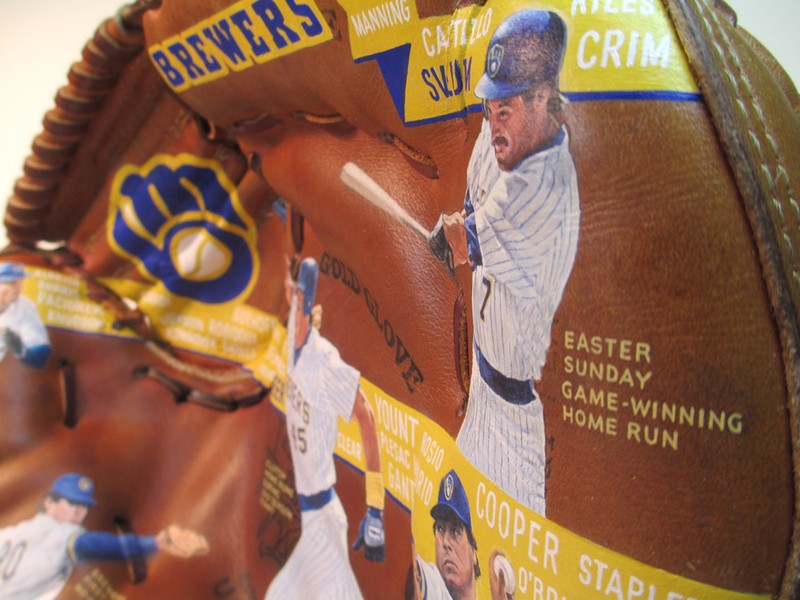 Previous paintings for the Brewers Fantasy Camp included '82 Brew Crew and Cecil Cooper glove art. 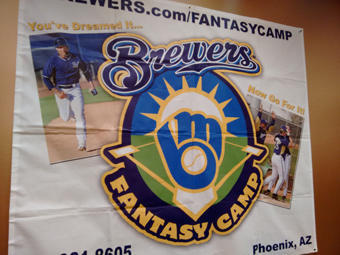 Big thanks to Brewers TV analyst and fantasy camp organizer Bill Schroeder, ace photographer Rick Ramirez and the Brewers camp staff and former players for welcoming me back to Phoenix for the third year in a row.